I'm in need of some help. Got a bit of a hickup with my urS6. After 2 years of standing (head replacement) I managed to get things back into place. However, as my luck goes my memory is letting me down with one specific section. As the coil packs went back on I found myself with the question of where do they plug in... I found a pic (see attacehd marked-up one) of what I'm assuming the orginal setup looks like but I seem to be missing the firewall plugs (or atleast some of the plugs). I've looked every where and can't seem to find the missing plugs for the coils. Either I'm missing a piece of wiring loom or I'm going crazy. See the second photo of what my engine bay looks like by the rack. How will I go about tracking down where the plugs are that I or someone probably unplugged at one point? There are connectors on the other end of these. 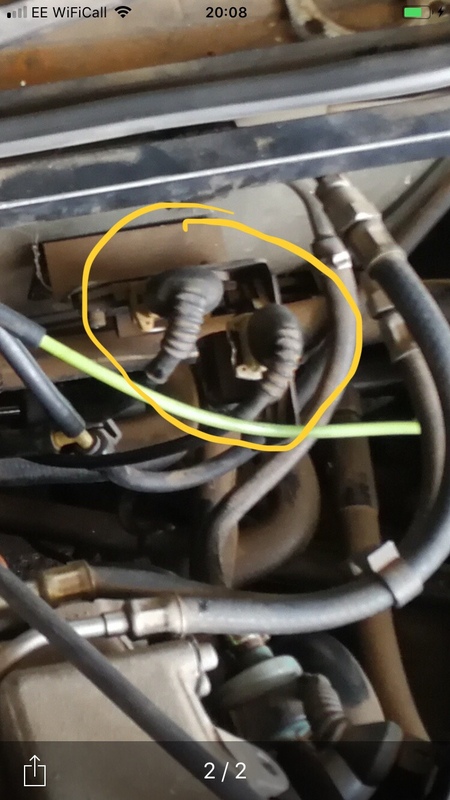 White connectors are +12v and connect to the white connectors on the main engine harness. 2x 3pin black connectors go into one side of the POS units. 2x 4 pin (black & brown) on main engine harness connect to other side of POS units.